Bumble bee tattoos offer a wide range of versatility in their design to people interested in having a bee inked on their bodies. Bumble bee tattoos can be tiny tattoos of friendly bees or large pieces highlighting the bee's more aggressive tendencies. Since some people are allergic to bees, the idea of getting a bumble bee tattoo might not seem appealing. 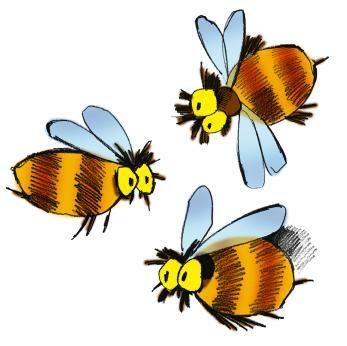 Unlike honey bees, bumble bees can sting multiple times. However, they are not normally violent and will only sting in order to defend their hive, their queen or themselves. Bumble bees also live structured lives. They pollinate crops and wild flowers before returning back to the hive. The hive becomes the organizational center of a bumble bee's life. 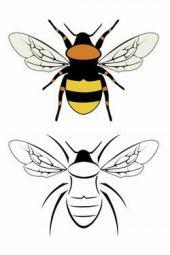 To people who admire the bumble bee, there is much symbolism that can be drawn from their life. Bumble bees are ordered and full of duty. They serve their queen with loyalty and scour the fields with passion. This ordered lifestyle can be an appealing symbol to people who appreciate structure. Bumble bees are also defenders. In a sense, they are the ultimate pacifist. They will not maliciously go to attack others. Rather, bumble bees will only strike when it is the last course of action they can take. This tendency is often attractive to people who believe in using violence only as a last resort. If you don't want a tattoo entirely dedicated to bumble bees, you could get a flower tat (or a field of flowers) and use a bumble bee to accent the tattoo. Doing so would allow you to create a scene within your tattoo without overwhelming your design with bees. Consider inking the scene across your back or even on your upper arm as part of a sleeve. One of the best things about bumble bees tattoos are that they can be tiny and out of the way. 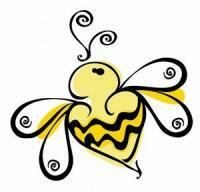 A friendly bumble bee tattoo would make a great tattoo for anyone looking for a small ankle tattoo. Want more than one bumble bee? A trail of tiny bumble bees across the foot can be an attractive way to get some bumble bee ink without going too large. For anyone with an interest in fairy tattoos, bumble bees can be the perfect compliment. Plan for a few bees to bumble around in the fairy's wings or around her feet. For those looking for a sizable bumble bee piece, a view downward on to the bee's back filled with great detail may be a good fit. Ink from this angle will remove the need to figure out what expression you would like the bumble bee to have. If you want to incorporate other design elements into your tattoo, the striped back of the bumble bee provides a great canvas for other patterns. Another popular bumble bee tattoo is an ornate bumble bee with lines behind the bee to show it's pathway. Often, the pathway of the bee will loop and circle. While it makes a great tattoo for anywhere on the body, it would be especially interesting on a curved body part, such as around the wrist or across the back of the neck. Bumble bees inspire many people for different reasons. As a result, bumble bee tattoos may be the perfect choice to help you remain focused in every aspect of life. For people who admire the aesthetic of the bumble bee, the ink makes a popular fit and can be easily incorporated into other pieces.